Schools in each area are ranked by the percentage of pupils achieving at least five A* to C grades at the GCSE or vocational equivalent, shown in the third column. 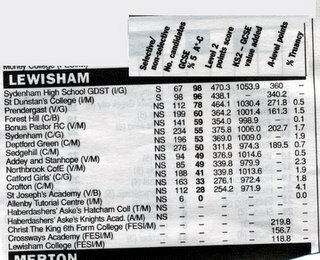 Ties are broken by the number of pupils taking exams, shown in the second column. The fourth column shows the average points score per candidate taking Level 2 qualifications. 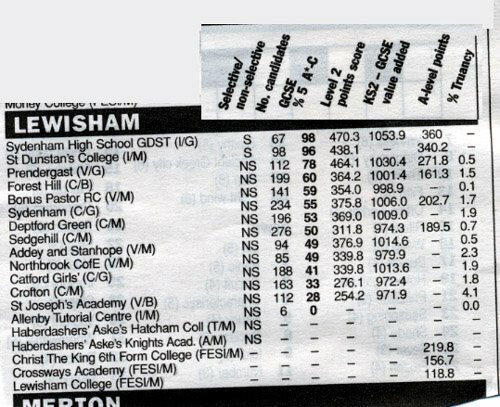 The fifth column shows the value added by a school to its pupils' progress between age 11 and GCSE. Full details can be found on the scan. Lewisham Schools listed (for those of you here via a net search) are Sydenham High School, St Dunstan's College, Prendergast, Forest Hill, Bonus Pastor, Sydenham, Deptford Green, Sedgehill, Addey and Stanhope, Northbrook, Catford Girls, Crofton, St Joseph's Academy, Allenby Tutorial Centre, Haberdashers' Aske's College and Knights Academy, Christ The King 6th Form, Crossways Academy and Lewisham College.